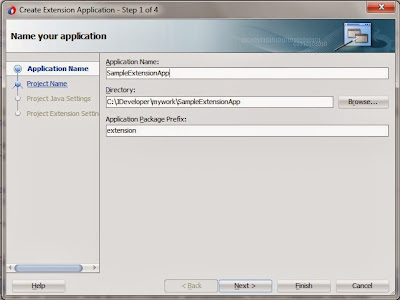 In this post we will be learning how we can create a Jdeveloper extension project and debug/run it. This post consist of only how to create extension project in Jdeveloper 12c workspace and run it. We will be developing extensions in the following posts. Ok so lets get started. Install Jdeveloper 12c and go to Help-> Check for updates. 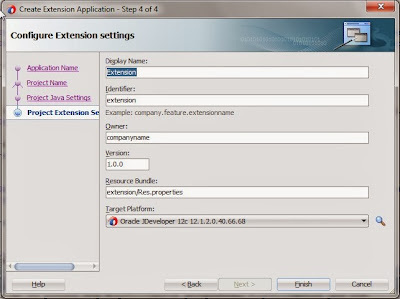 Do next to search and find Extensions SDK as below. Click next and install it. Click finish and Jdeveloper will restart. 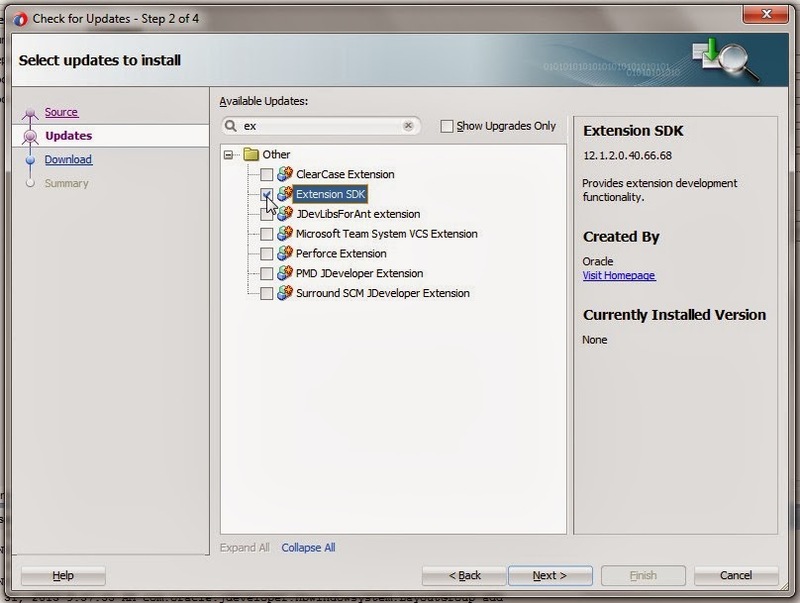 Now when Jdeveloper will restart, it will ask to install Jdev Extensions example. Install these examples, as they provide good base to start understanding and playing around with extensions. 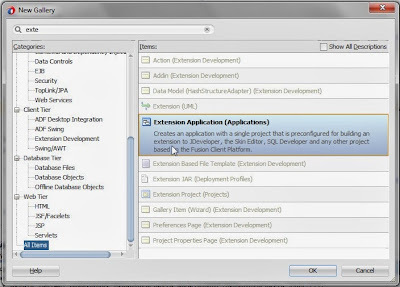 Provide a directory in workspace to add the jdev extension projects and click ok. You can see the projects in your work space. You can refer to these at any time. There is a nice description about these projects on OTN. Below is the link to the same. 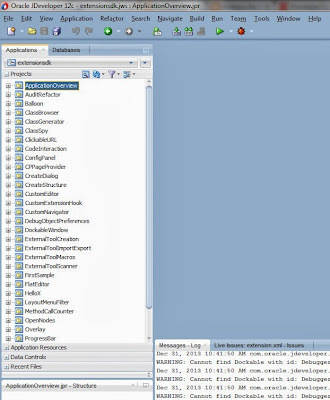 So we are good with our extensions development environment and samples. Lets create our first jdev extension project. Go to file, and select new application. 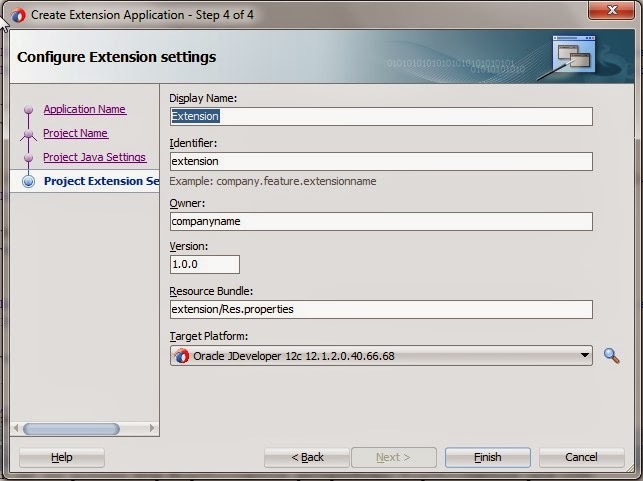 Select extensions application from the menu as below. 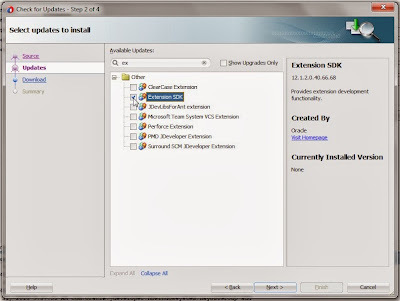 Click next on next 2 screens and check for package and project name. 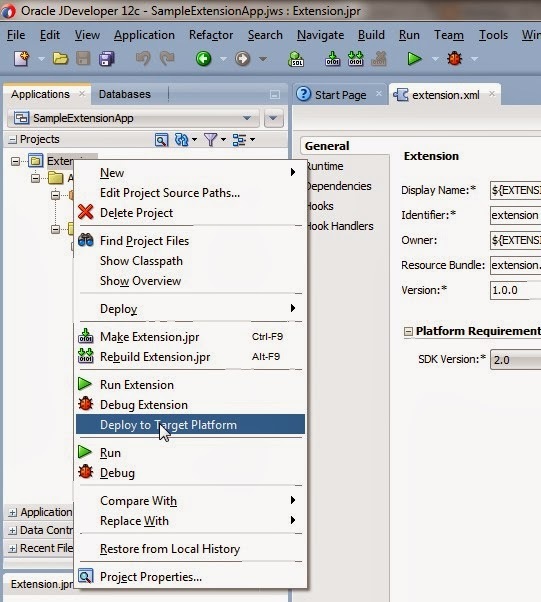 On the last screen , target platform will be selected by default. Keep it as it is and click next. So we created our first jdev extensions project. Now Lets see how we can run/debug the project. But before we can run/debug, we always need to do deploy to target platform. This basically creates a jar and deploys to [jdev-root]\jdev\extensions directory of your JDeveloper. Now we are all set to Run/Debug the jdev extension. 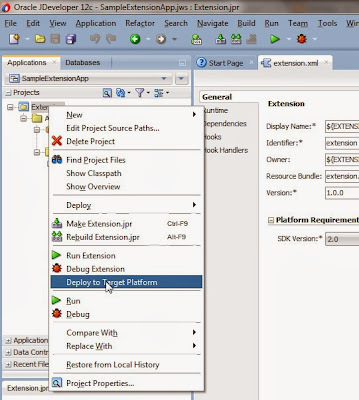 Once clicked Run/Debug, new jdeveloper will be opened including the custom extension which projects adds to it. There is one very important step which we missed after creating the project. Check it here Configuring Extensions.xml and Manifest.MF after creating extensions project . We will be going through developing extensions in the following posts.